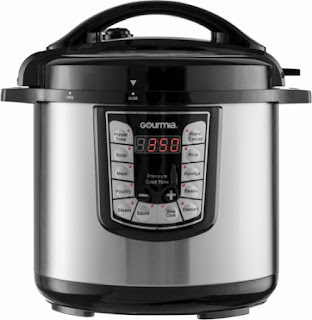 Today get this Gourmia - 8-Quart Pressure Cooker - Stainless steel ONLY $49.99 (Retail $99.99). Explore a multitude of options with Gourmia's electronic Smart Pot Pressure Cooker. Gourmia's Smart Pot rivals other electric pressure cookers in ease of use (one touch settings pad), versatility (13 uses), keep warm option, and clean up and maintenance. The Smart Pot has an auto locking lid and auto pressure control, making it completely safe, every time. It's also crafted of quality, durable materials - an inner non-stick liner and a stainless steel exterior.